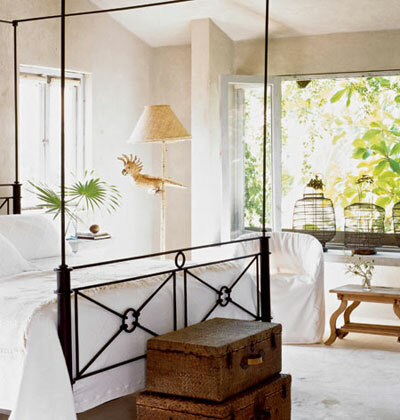 We can never stop talking about the beach home bedroom designs. There is so much to use and so many elements to incorporate in this design theme that you would love the fact that you are living near the beach, enjoying the sand and the sunshine. Here, we are presenting a few more beach home bedroom design ideas so that you can find the best before you begin with the décor process. Remember, these ideas are simple, interesting and very appealing. So buckle up and get ready for the all new furniture and décor tips that would work well for you. A bedroom with a chocolaty twist- chocolate brown is one of the most popular colors to be used for home decoration all around the world. The color is deep, dark, warm and comforting, all at the same time. This is also why it is so popular. You can use a very light shade of green or even indigo blue on the walls. Then use a chocolate colored bed and top it off with a white mattress and bed sheet. Finally, go for chocolate colored (and slightly colorful patterned) brown sheets. You can also use patterned sheets on the top that can be mixed well with plain brown bed sheets. Finally, add some light blue and white sea themed cushions to the bed and you are ready for a beautiful bedroom. The rest of the furniture of the room should be a lighter shade of brown. The shipwrecked bedroom- no, it’s not really shipwrecked or messy but the appeal is very sandy because of which this bedroom theme gets the name. The walls of the room would not be white. Unlike the other design ideas that most of the beach home bedroom designs follow, we are going to keep every kind of upholstery in white and use a sandy, grainy brown or yellow color on the walls. The color should be medium-dark in order to get the best appeal for your bedroom. Remember, you have to be really careful while selecting the hue or the room would appeal unnecessarily dark and gloomy. The bed should be a very dark chocolate brown canopy bed with sheer white curtains. Other furniture of the house should be shades of lighter brown in order to get an authentic appeal. Remember, you only have to use white with fabric and nothing else. This would help the room in looking really calm, soothing and beautiful. Use white sheer curtains to complete the look. Coast inspired peppy décor- we have mostly used two colors in the beach bedroom décor ideas till date. It is time to go for something more colorful. Start with the walls. Be bold and use teal on the walls. This beautiful deep shade would definitely be providing more personality to the walls. Now, use dark brown colored bamboo, rattan, wicker or cane beds and bed furniture. Team them up with deep lemon green plain curtains, white bed sheets with beautiful floral prints and similar cushions and pillows. The room would definitely look more interesting and inviting than ever.